That's not to say there's no point in talking about it. Discussing art of all forms is a time-honored tradition. Not only is it fun to pick apart a recent movie with a friend, or talk about your favorite music, but it also helps push those art forms further. So let's discuss the question of difficulty from an even-tempered point of view. I want to hear your thoughts on this as well, so when you're finished reading my opinion please leave yours in the comments at the end. For years, you can't say a game was hard without comparing it to Dark Souls. It's become the gold standard of difficulty, even if (surprise!) it's not the hardest game around (sifting through some old NES games quickly proves that point). That's because I believe Dark Souls was designed very specifically to go against the grain of modern gaming. While the industry kept moving towards an easier, more streamlined experience, Dark Souls created something that wouldn't hold your hand. The point, really, was to go against the norm. For that reason, I don't think Dark Souls (or to be more relevant, Sekiro) should have an "easy mode." It would directly contradict the theme of the artwork that is these games. When you think of it as art to be appreciated as opposed to just a game to have fun with, it becomes easier to understand why an easier option would upset fans and muddy the message. True as that may be, as a consumer it does make me sad. I like Dark Souls, but not for the difficulty. I love the exploration. The old-school RPG elements and numbers-crunching mixed with decent combat is fun. The tone and atmosphere is spot on. And sure, the tension of facing down a really tough boss is great, as is the exhilaration from finally overcoming it. There's a lot to like about Dark Souls, but there's also a lot I don't enjoy. I never liked losing my souls if I can't get back to where I died. Sure, it adds to the stakes, but I think the long trek back to where you were already gives dying consequence. I don't even mind the spacing of bonfires as much as I do losing those souls if I can't get back. It encourages me to play too safe, maybe even grind for levels to be better prepared, and that kinda breaks the flow of the game (and the tension). Also, losing humanity when you die is a baffling mechanic to me that isn't appealing in the least; you know you're going to die in this game, so why punish struggling players further? Since human effigies are finite and I'm a hermit who doesn't like playing with others, I pretty much played with that Ring of Binding equipped all the time. Which... kinda feels like a pointless design choice. So as much as I like parts of Dark Souls, these needlessly punishing parts discourage me from playing it more than once in awhile. So what if Dark Souls had an option to turn those specific mechanics off? We may never know, but I have a feeling I would enjoy the game ten times more. Two games that handle this well are Celeste and Wargroove. In addition to the standard "Easy," "Medium," and "Hard" difficulty settings, Wargroove offers a custom option. Here you can tweak specific aspects of the game to what you enjoy the most. But the absolute best example of this is Celeste. In case you haven't heard, Celeste is hard. And like Dark Souls, it is supposed to be hard. But they have an optional Assist Mode, and the way that they explain it in game is beautiful to me. "Assist Mode allows you to modify the game's rules to reduce its difficulty. This includes options such as slowing the game speed, granting yourself invincibility or infinite stamina, and skipping chapters entirely. Celeste was designed to be a challenging, but accessible game. We believe that its difficulty is essential to the experience. We recommend playing without Assist Mode your first time. However, we understand that every player is different. If Celeste is inaccessible to you due to its difficulty, we hope that Assist Mode will allow you to still enjoy it." Emphasis mine, because that last line nails what I'm trying to say. Celeste strongly encourages you to play it as intended, but at the end of the day empowers the players to decide what is fun for them. This is also why I love games with robust mod support. Skyrim is a good game made great because it empowers players and modders to create their own perfect version of it. I love that freedom, and I respect any game that let's me play how I enjoy—even if it's not exactly how the game developers intended. Having said all that, there's a side effect of hard games I really don't like—the elitist attitude it breeds. One way or another, the community around something can really shape your opinion about it. Sometimes the community makes it better (the Skyrim community clearly loves that franchise more than its creators, and put far more effort and passion into it). But too often a toxic community can put you off of something you otherwise like. I have friends who really enjoy Rick and Morty, but are embarrassed by the show's community at large. A lot of these "Sekiro/SoulsBorne" games seem to suffer from this. People use these games as a way of feeling superior to others, as bragging rights to boast about on the internet. Obviously, this makes up a vocal minority of the fans, but a word to them; having adjustable difficulty shouldn't affect your enjoyment of the game. It really feels like some people want to gate these games off as some exclusive club where only the best can say they beat it. This is a little baffling to me, because if you need bragging rights, you can always brag about beating it the normal way. But if someone primarily plays for the story, giving them an easier mode really shouldn't make any difference on your sense of accomplishment. This mentality is the one thing that really bothers me. I'll take unfair game mechanics over dealing with someone who thinks they are better just because they beat a game any day. So Should Games Have An Easy Mode? In my opinion, yes and no. I feel strongly that games are made stronger when they empower players to have fun in their own ways, and that includes difficulty options. As a lover of games as both entertainment and art, I truly believe almost any game would benefit from more options to fine-tune the player experience. However, I DON'T think Sekiro or its SoulsBorne brethren should have these options. As much as I'd enjoy them more if they did, it clearly goes against what From Software is trying to achieve with these games. And at the end of the day, I think any artist (no matter the medium) should create what they believe in. After all, not everyone is going to like it anyway—might as well make the art you would like. Alright, you've heard my thoughts, what about yours? Do you think games should have adjustable difficulty options? 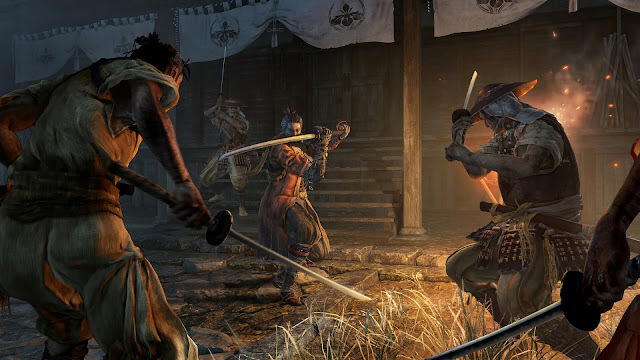 Are they better off with a focused vision like Sekiro? Let me know in the comments below!